Definition at line 2419 of file wingdi.h. Definition at line 2420 of file wingdi.h. Referenced by check_vertical_metrics(), D3DXCreateTextW(), DoEntry(), draw_text_2(), ftGdiGetGlyphOutline(), SOFTWARE_GdipDrawDriverString(), test_GetCharABCWidths(), test_GetGlyphOutline(), test_negative_width(), test_vertical_font(), wglUseFontBitmaps_common(), and wglUseFontOutlines_common(). Definition at line 2421 of file wingdi.h. Referenced by D3DXCreateTextW(), DoEntry(), draw_text_2(), ftGdiGetGlyphOutline(), SOFTWARE_GdipDrawDriverString(), test_GetGlyphOutline(), test_GetGlyphOutline_metric_clipping(), test_negative_width(), test_vertical_font(), wglUseFontBitmaps_common(), and wglUseFontOutlines_common(). Definition at line 2423 of file wingdi.h. 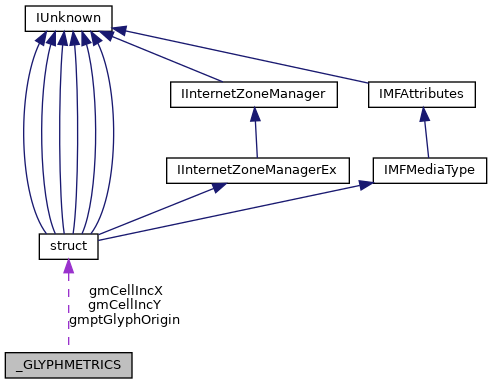 Referenced by check_vertical_metrics(), D3DXCreateTextW(), DoEntry(), draw_text_2(), format_string_callback(), ftGdiGetGlyphOutline(), PATH_ExtTextOut(), SOFTWARE_GdipDrawDriverString(), test_GetGlyphOutline(), test_negative_width(), test_outline_font(), wglUseFontBitmaps_common(), and wglUseFontOutlines_common(). Definition at line 2424 of file wingdi.h. Referenced by D3DXCreateTextW(), DoEntry(), draw_text_2(), format_string_callback(), ftGdiGetGlyphOutline(), PATH_ExtTextOut(), SOFTWARE_GdipDrawDriverString(), test_GetGlyphOutline(), test_negative_width(), test_outline_font(), wglUseFontBitmaps_common(), and wglUseFontOutlines_common(). Definition at line 2422 of file wingdi.h. Referenced by check_vertical_metrics(), D3DXCreateTextW(), DoEntry(), draw_text_2(), ftGdiGetGlyphOutline(), SOFTWARE_GdipDrawDriverString(), test_GetCharABCWidths(), test_GetGlyphOutline_metric_clipping(), test_negative_width(), wglUseFontBitmaps_common(), and wglUseFontOutlines_common().